The Midnite Solar Classic Lite 200 MPPT battery charge controller substantially increases the flexibility, features and range currently found on all other MPPT controllers. The solar consultants at Blue Pacific Solar love specifying Midnite solar products in many of the systems we design. Why? Well frankly because they are American made, they are designed for the most durable off-grid conditions by engineers that are not afraid to get their hands dirty and they just plain work well. MidNite Classic charge controllers offer many useful features including Arc Fault Detection and Ground Fault Protection (GFP) which eliminate the need for a separate GFP breaker assembly. NOTE: These features are not available on the Classic Lite) Three sizes are available to accommodate solar arrays with operating voltages up to 150, 200, or 250 VDC. Classics have a unique feature called HyperVOC. 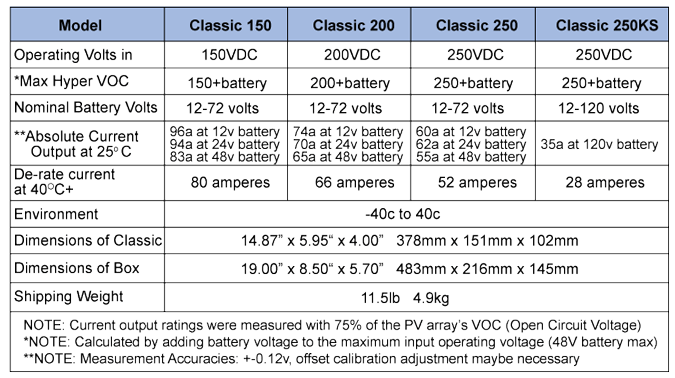 HyperVOC refers to when the DC input voltage raises above the maximum operating voltage (150V, 200V, 250V, depending on the Midnite Solar Classic model). HyperVOC gives you the flexibility to go up to the maximum operating voltage plus the nominal battery voltage. For example, the Midnite Solar Classic Lite 200 charge controller has an input voltage rating of 150 operating volts, if the Classic Lite 200 is connected to a 48 volt battery bank, the HyperVOC voltage limit will be: 150V + 48V a total of 198 Volts that the Classic can withstand without breaking. When the Classic input voltage rises above 150 volts it will switch off (stop outputting power). As long as the Classic is in HyperVOC mode, the microprocessor and all other functions like AUX will continue running. When the input voltage comes back down below 150v (or the rated operating voltage of the Midnite Solar Classic, depending on model) the Classic will wake up and start charging again automatically. This could happen in a really cold morning with a system that has a voltage open circuit (VOC) close to the maximum operating input voltage. When the Midnite Solar charge controller is in HyperVOC mode, A HyperVOC message will be displayed on the bottom right side of the status screen. 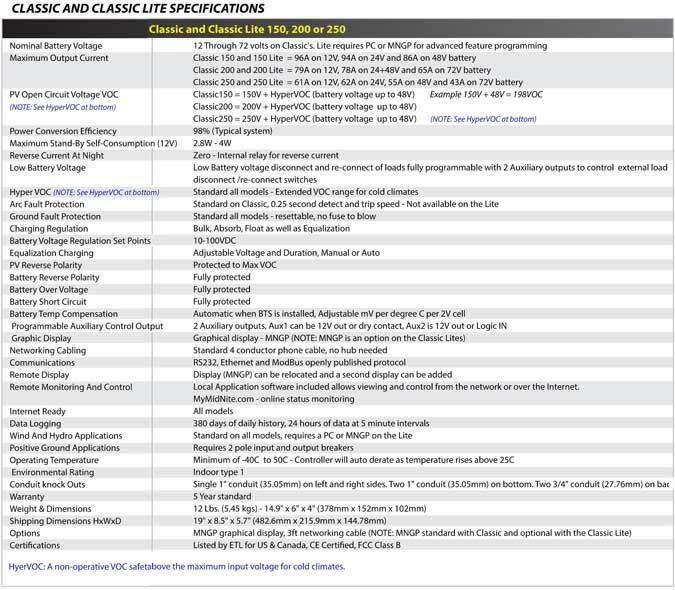 The Classic Lite 200, 200 and 250 are Listed to UL 1741 and CAN/CSA C22.2 No. 107.1:2001/09/01 Ed: 3 (R2006) and are covered by a 5-year warranty. Dimensions are 15"H x 6"W x 4"D, and weight is 11.5 lbs for all units. 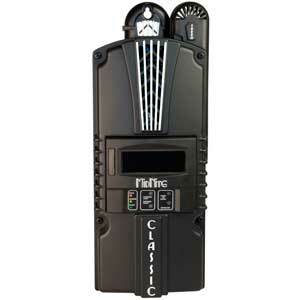 NOTE: The primary difference between the Classic and Classic Lite is the Classic Lite has NO LCD (Liquid-Crystal Display) and NO built in Arc-fault Protection. NEC (National Electric Code) 2011 requires an ARC FAULT detector on all charge controllers and inverters operating above 80VDC. MidNite Controllers ship in 3 - 5 business days after funds clear. Midnite Solar Classic Lite 200 charge controllers is a solid-state electronic device that, when sized properly, can be used in nearly every solar and wind energy system that uses batteries. The Charge controllers Blue Pacific Solar sells employ the latest in power electronics to regulate the battery charge by controlling the charging voltage and current from a solar panel array. Charge controllers regulate the charge of the battery, but also prevent the battery from being over discharged which can damage the battery bank. Midnite Solar Classic Lite 200 charge controller uses multiple stages of control to regulate different voltage and current levels. The voltage and current of a battery varies over the different stages of battery charge. Though the amount can vary, the bulk charge usually is approximately 80%, the absorption charge is 10% with the float charge representing the balance of the battery charging process. The bulk charging stage of the charge controller process is the first stage to used to bring the battery depth of discharge (DOD) back to 100%. The bulk charge stage happens first in in the morning after the batteries DOD has drained down since sunset the previous day. The bulk charging stage pushes as many amps into the battery bank as possible from the solar panels and gets the voltage up in the process. The effect of a charge controller is not unlike trying to fill a glass of water from a faucet. You first turn the faucet on full while the glass if filling, then slowly taper off the pressure until the glass is full. When the battery bank reaches a predetermined level known as the bulk voltage set-point, the charge is then substantially slowed. Because the bulk voltage set point is determined by the type of battery you are using, many charge controllers have to be pre-set to the type of battery which will dictate the rate of charge. The second state of charge the charge controller employs is the absorption stage. After a battery system has been brought up to the bulk voltage set point, the charge controller slows down the charge rate because the battery bank cannot accept the same rapid charging pace without overheating and damaging the battery bank. At the absorption stage a battery bank is only about 80% full. The absorption charge is the function level in the process that tops off the battery bank. During the absorption stage, the charge controller holds the battery volts constant and reduces the amount of current sent into the battery. When the absorption stage is complete, the battery bank is fully charges. The final step the charge controller performs is the float charge. Typically a charge controller enters into a float charge state when the other charge levels of the battery bank has been achieved. When the number of peak sun hours is limited, a solar charge controller may not be able to get the battery bank back to the float stage before the next cycle begins. IMPORTANT SAFETY INSTRUCTIONS: Midnite Solar Classic Lite 200 Charge Controller. (OK, here is the scary legal disclaimer.) It is the responsibility of the purchaser to ensure that all products are installed and operated in accordance with local and national building codes as specific by the NEC (National Electric Code), UBC (Uniform Building Code) or IBC (International Building Code) and local utility company policy. This product is designed for indoor or protected compartment installations. DO NOT expose the to rain, snow, moisture or liquids of any type. Use insulated tools to reduce the chance of electrical shock or accidental short circuits. Remove all jewelry such as rings, watches, bracelets, etc. when installing the Charge Controller or any other electronic gear. Always disconnect the batteries or energy source prior to installation or performing maintenance on the charge controller inverter. Live power may be present at more than one point since an inverter utilizes both batteries and AC electricity. Turning off the Charge Controller may not reduce that risk. Always verify proper wiring prior to starting the inverter. 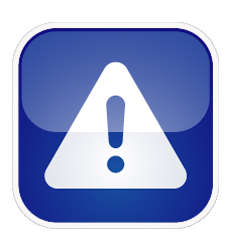 Do not operate the charge controller if it has been damaged. Always read and follow the manufactures installation and operating instructions for the Midnite Solar Classic Lite 200 charge controller prior to installation and operation.